Southern Pacific Railroad, 1930 3.5" x 16.5" foldout. Mile by mile description of the scenery on the 'Daylight - Northbound.' Clean, yellowed, undamaged. Size: 3.5" x 6". Pamphlet. Very Good. 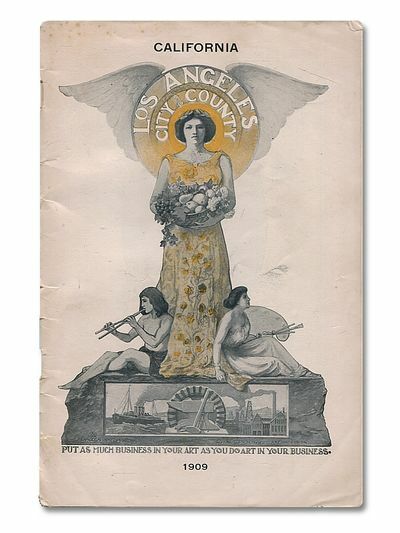 Los Angeles: Los Angeles County Chamber of Commerce 64 pp with sepia photos on every page. An overview of Los Angeles County with an empathasis on the city of Hawthorne. Text is clean, tight and unmarked. Decorative card covers are whole and bright, rubbed along spine. Size: 6" x 9". Stapled Softcover. Very Good. Rand mcNally & Co., 1925 Rand mcNally & Co., 1925 0237 (3) pp with B&W illustrations on every page and a 21" x 28" map bound in after text. Text is clean, tight, unmarked, yellowed. Map is complete with a small stain near spine and one closed split along interior folds. Decorative paper covers are rubbed at extremities. Trade Paperback. Good Plus. 5" x 8".. Paperback. Good Plus. New York: Burroughs Wellcome & Co, 1934 New York: Burroughs Wellcome & Co, 1934 160 pp with B&W photographs and line drawings on every page. 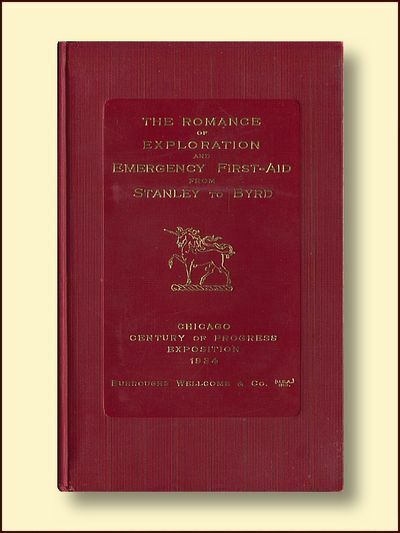 Created for the Chicago Century of Progress Exposition of 1934, this handsome little book contains descriptions of some of the most famous expeditions of the second half of the 19th Century, encompassing Africa, polar exploration and air travel, with an empathisis on the explorers' use of Burroughs Wellcome first-aid products. Burroughs Wellcome were the of inventors the compacted powder pill, which they called Tabloids, which made dosage for the first time uniform and exact. The explorers are quoted as how pleased they were to have medication in a non-perishable and easy-to-administer form. Text is clean, tight and unmarked with silver paper endpapers. The red boards with gold-stamped title and heraldic device are clean, bright undamaged. 16mo - over 5¾" - 6¾" tall. Hardcover. Fine/No Jacket as Published. 16mo - over 5¾" - 6¾" tall.. Hardcover. Fine/No Jacket as Published. Dust jacket present. New York, New York, U.S.A.: Modern Library, 2001 243 pp. with B&W illustrations in text.Described as "The Expanded Edition. "Translated by Alison Anderson with additional material from William Barr's translation from the Russian. Part of the Modern Library Exploration series. With a preface by Jon Krakauer, Series editor and an introduction and epilogue by David Roberts. text is clean, tight,unmarked. cover has a little bumping at edges otherwise clean and bright.. Trade Paperback. Very Good/No Jacket as Published. Dust jacket present. New York: The Literary Guild, 1936 435 pp.The private papers of James Boswell from Malahide Castle. Text is exceptionally clean, tight and unmarked save for previous owner's name on flyleaf. There is a barely visable strip of moisture staining aprox 1/4 inch deep along top edge of pp. i-xvii . Pictures of Boswell and Johnson and the flaps of the DJ have been pasted on the front and back endpapers. A foldout map of the journey on heavy paper is the frontis. Four B&W photographic plates of the original manuscript ( the listed plate of Rorie More's claymore is not a plate but a line illustration within the text). The tan cloth boards with brown printing are clean and only lightly bumped. This is a large, solid book in overall Very Good Plus condition. Size: 8vo - over 7¾" - 9¾" tall. First Thus.. Cloth. Very Good +/No Jacket. First Edition. Los Angeles, California, U.S.A.: Chamber of Commerce, 1909 Los Angeles, California, U.S.A.: Chamber of Commerce, 1909 78 pp with B&W illustrations and a fold-out map. 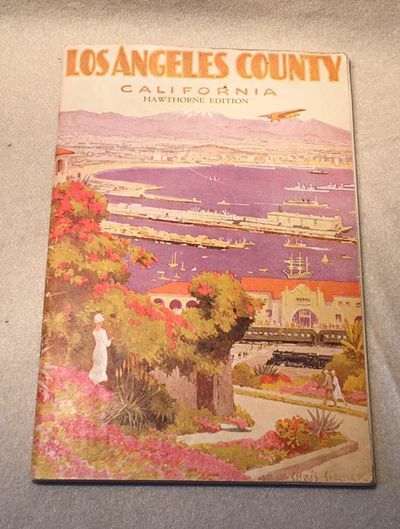 Offered by the Los Angeles Chamber of Commerce as an enticement and guide for Easterners looking to emmigrate to Southern California, with infomation on the various communities, educational institutions, the price of land, and the types of trades in demand. Text is clean, tiight and unmarked. Map is undamaged. Covers with nice arte deco cover art of Pomona, Goddess of Plenty, are partially split along spine, with some edgewear. 21st Edition. Soft Cover. Very Good. 6" x 9".. 21st Edition.. Paperback. Very Good. First Edition. Newbury, Berkshire: Countryside Books, 1990 With historical notes. Text is clean, tight unmarked. Cover is clean and bright. 96 pages. 12mo - over 6¾" - 7¾" tall Size: 12mo - over 6¾" - 7¾" tall. Trade Paperback. As New/No Jacket. Interlink Books, 2003 " Exotic nature and the horrors of the slave trade - a candid portrait if eighteenth century colonial life." First published in French in 1773. 290 pps. As new throughout.. 1st Edition Imprint. Trade Paperback. As New. Illus. by Wilson, Jason. 5 1/8" X 8". First Edition. New Delhi: Manjusri Publishing, 1972 New Delhi: Manjusri Publishing, 1972 A reprint of the 1885 classic in a Limited Edition of 1000, of which this is number 58.Text is clean, tight and unmarked. Front and endpapers have a few spots. The red cloth boards with gold-embossed leather spine and corners are slightly warped but clean. The DJ is yellowed, soiled, with chipping at spine. 12mo - over 6¾" - 7¾" tall. Limited Edition. Half-Leather. Good +/Good Minus. 12mo - over 6¾" - 7¾" tall.. Limited Edition.. Hardcover. Good +/Good Minus. Dust jacket present. Berkshire: Countryside Books, 1990 Berkshire: Countryside Books, 1990 Thirty circular walks in the largest medieval forest in western Europe. With historical notes and maps. Text is clean, tight and unmarked. Covers are clean and bright. Trade Paperback. As New/No Jacket.. Paperback. As New/No Jacket. London 1904: David & Charles, 1987 London 1904: David & Charles, 1987 With B&W illustrations. Text is clean, tight and unmarked. DJ is clean and bright, no scuffs or tears. 12mo - over 6¾" - 7¾" tall. First Edition. Hard Cover. As New/As New. 12mo - over 6¾" - 7¾" tall.. First Edition.. Hardcover. As New/As New. Dust jacket present. First Edition. Newbury, Berkshire: Countryside Books, 1990 Newbury, Berkshire: Countryside Books, 1990 Part of the "Walks for Motorists" series. Text is clean, tight, unmarked. Cover is clean and bright. 96 pages. Revised Edition First Printing. Trade Paperback. As New/No Jacket.. Revised Edition First Printing.. Paperback. As New/No Jacket. First Edition. Which? Books, 1988 Which? Books, 1988 A guide to over 200 circular walks in outstanding surroundings throughout Britain. This guide appears to have been on some walks. Text is clean, tight and no underlining but several hikes have "done!" in ink .Endpapers are a little soiled and curled , as are covers. Soft Cover. Good/No Jacket.. Paperback. Good/No Jacket. Edinburgh: Kittiwake Press, 1989 Profusely illustrated with maps and B&W illustrations. Text is clean, tight and unmarked. Cover is bright and clean. 64 pages. 12mo - over 6¾" - 7¾" tall Size: 12mo - over 6¾" - 7¾" tall. First Edition.. Trade Paperback. As New/No Jacket. First Edition. St. Louis: House of Repreasentatives Mis. Doc. No. 44, 2006 345 pps. Some B/W photographs.Text clean, tight, bright and unmarked. Book is as new apart from some minor scuffing on back cover. Dedication by author on title page.. By Author on Title Page. 1st Edition. Trade Paperback. Near Fine. 6" x9". First Edition. New York: Dodd, Mead, 1980 276 pp with four B&W plates. Text is clean, tight and unmarked. Previous owner's name on FFEP. Red cloth boards are "good," with some fading and bumping to spine ends. DJ is rubbed with several closed tears. In mylar jacket.. First Edition.. Hardcover. Very Good/Poor. Dust jacket present. First Edition. Newbury, Berkshire: Countryside Books, 1989 With historical notes. Text is clean, tight unmarked. Cover is clean and bright. 96 pages. 12mo - over 6¾" - 7¾" tall Size: 12mo - over 6¾" - 7¾" tall. Trade Paperback. As New/No Jacket. Buckinghamshire,UK: Shire Publications, 1989 Ten circular walks with maps and historical notes. Text is clean, tight and unmarked. Covers are clean and bright, no bumps or scuffs, reading crease at spine. 63 pages.. Third Edition.. Trade Paperback. Very Good +/No Jacket.